For men with fine or thinning hair who don't want to shave their heads or work on their combover skills quite yet, thickening shampoos can be a great option. It may seem difficult to weed out the thickening shampoos that actually work from the ones that will ultimately be a disappointment. Understanding what to look for in a men's hair thickening shampoo is a great place to start. 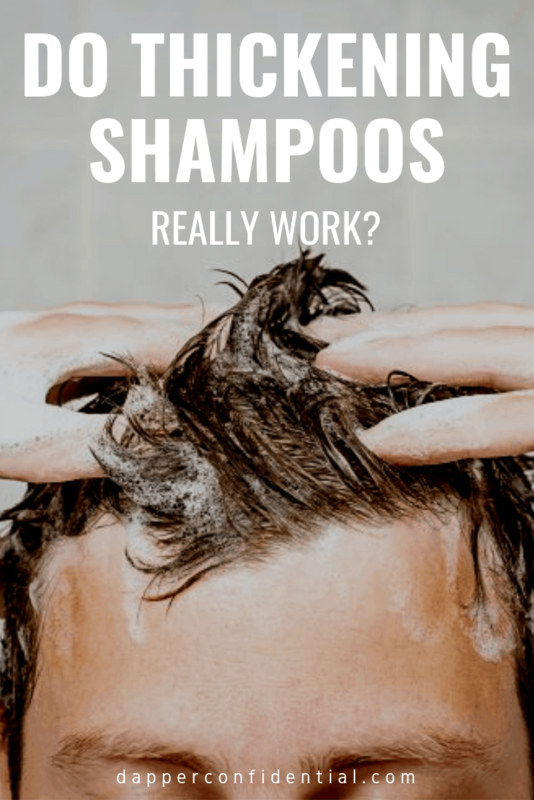 Let's take an in-depth look at how thickening shampoos work, and check out some of the best hair thickening shampoos available for men today! Can the Right Shampoo Actually Make Hair Thicker? When are Thickening Shampoos a Good Idea? What's the Difference between a Volumizing Shampoo and a Hair Thickening Shampoo? The simple answer is yes. A quality hair thickening shampoo for men can actually help make hair visibly thicker over time. Here's How it Works: Every hair on your head is rooted in a cylindrical structure called a follicle. Everyone has a different amount of hair follicles. How you care for your hair follicles directly impacts hair growth and thickness. Many people don't realize that they're damaging their hair follicles. When hair follicles become clogged or suffocated with dirt, oil, sebum, or waxy products, they can become unhealthy and even die. This will not only make hair look thinner but can decrease your hair follicle count over time. A quality men's hair thickening shampoo will free up and nourish hair follicles helping them swell to their full potential and improve the health and overall thickness of your hair with correct usage. More than that, taking good care of your hair can boost your mindset and improve your self-image. Using a men's hair thickening shampoo can help you on that quest. When are Men's Hair Thickening Shampoos a Good Idea? If you want to boost the thickness of your hair or improve the health of your hair follicles, a high-quality thickening shampoo may be the answer. Many men don't take time to consider that the daily use of low-quality shampoo might be slowly damaging their hair. Men who have been using damaging products and then switch to a quality thickening shampoo usually begin seeing a difference in their hair's health very quickly. Hair thickening shampoos are also great for men who want generally healthy hair. This is because these products are usually formulated with ingredients that work at the roots to nourish hair follicles and are all around good for your scalp. If you feel that your hair is thinning, the best shampoo for thinning hair will be one designed to ensure that you do not experience further hair follicle loss. This can be done by nourishing your remaining hair follicles and helping ensure that they are strong and healthy. Though both of these types of shampoos focus on clearing sebum and grime from the roots of your hair without weighing it down, they have a few key differences. It all comes down to the formulas that they're composed of. Volumizing shampoos are formulated with ingredients that give your hair a light-weight and bouncy feel. This sometimes means that they can contain silicone derivatives and even drying alcohol agents. They may add volume, but can actually damage the overall health of your hair by drying it out. 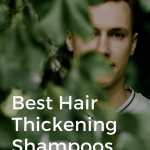 Hair thickening shampoo for men, on the other hand, works to nourish hair at the root while simultaneously cleaning and plumping up hair follicles. It also usually aim to keep your hair clean, manageable and soft. Now that you understand a bit about how these shampoos work, let's review some of the best formulas available for men today. Remember, everyone's hair is different, and what may work for one person might not be ideal for the next. 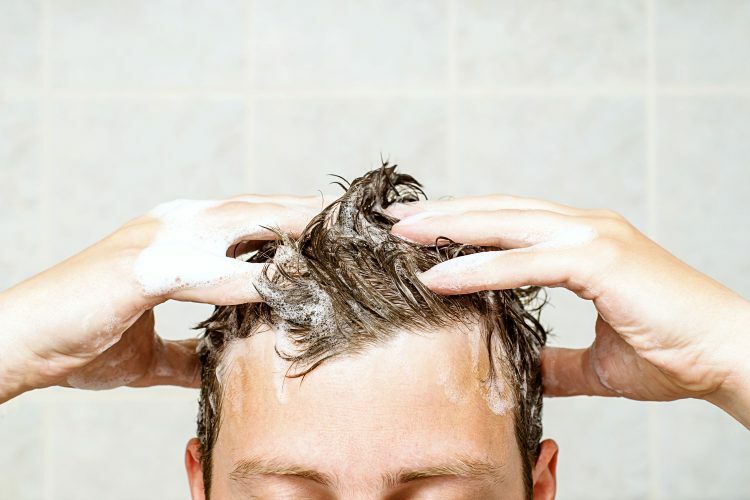 This product guide to the top hair thickening shampoo for men is just your starting point. We recommend trying a few of these products out until you find the one that gives you the results you're after! Formulated using an impressive and organic proprietary thickening complex of vitamin B5, basil, white lupine and Biotin, Jack Black Thickening Shampoo helps to keep your hair thick and flake-free. Utilizing certified expansion technology, it encourages growth and fullness from root to tip. R+Co's unique thickening shampoo revitalizes fine flat hair. It's rejuvenating was designed by some of the top hairstylists out there, and infuses hair with fullness and vitality! Antioxidants and oxidating agents provide volume and protection against free radicals while golden root extracts combat thermal stress. This thickening shampoo by Re:line is fantastic for men experiencing hair loss. It works so well that it comes with a 100% money back guarantee! Formulated to stimulate hair growth on a cellular level, it contains plenty of vitamins and biotin. It also completely removes and blocks harmful DHT to help prevent further hair loss! This formula energizes your scalp and hair follicles with all organic and gentle ingredients. Botanicals, essential oils, biotin, saw palmetto, plant protein & vitamin E all combine to help build body in fine or thinning hair as well as strengthen hair strands with every use. It's a fantastic all-natural solution. This 2-in-1 shampoo conditioner combo is ideal for thinning hair and damaged scalps. It gently cleanses and moisturizes with a formula that's full of moisturizing agents that's perfect for daily use. With no parabens, phthalates, dyes, or sodium lauryl sulfate, this is the perfect all-in-one product for men who want thicker, healthier hair. This shampoo instantly adds volume and thickness to any hair type! It's jam-packed with vitamins and minerals that encourage hair growth and help to protect and heal damaged follicles. Key ingredients include aloe vera, Rosemary Extract, and Biotin. Hair will feel noticeably healthier after just one use. This refreshing shampoo combines elements like zesty lemon, soothing sage, invigorating and tingly peppermint, and nourishing tea tree oil. Tea tree is fantastic for adding thickness to hair by clearing away dead skin cells, sebum, and dandruff. It also helps nourish your scalp and roots and smells amazing! This shampoo is fantastic because it not only adds fullness and body to hair but utilizes a gentle cleansing effect that leaves absolutely no residue. It smells fantastic and quickly clears grime away from each hair follicle before rinsing clean, leaving a fresh and enticing scent. It's also a fantastic value for the money. Men's hair thickening shampoo is not your only option. Find more tips from experts on what to do with fine or thinning hair here.